This Lens Mount Adapter from Viltrox is designed to allow a Canon EF-mount lens to be used with autofocus on a Sony E-mount camera. The underside of this adapter's removable tripod foot is tapped with a 1/4"-20 accessory thread, providing for direct attachment to a tripod or quick release plate that features a 1/4"-20 mount. For ease of upgrading its firmware, this adapter also includes a micro-USB port. 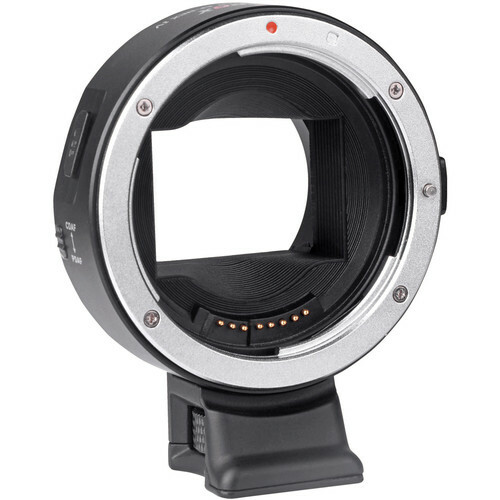 For compatible Sony E-mount cameras that feature phase-detection and contrast-detection autofocus, a toggle switch to enable those autofocus settings with a connected Canon EF-mount lens is positioned along the side of this adapter. To properly apply a desired autofocus setting, the toggle switch selection must be made prior to placing the adapter on the camera. This adapter is compatible with the Sony NEX-5C, C3, 5N, F3, 5R, 6, 7, FS700, VG20, VG900, and Sony Alpha a7-series cameras.